Most boletes, and certainly all of the common ones found in Britain and Ireland, are ectomycorrhizal fungi. This means that they form mutualistic relationships with the root systems of certain kinds but of trees and/or shrubs (usually with one or more plant genera). If you want to improve your chances of finding Ceps, it helps a great deal if you look in the right kinds of places and under the trees that these magnificent mushrooms are most commonly linked to. There is a lot more information on this topic, including chapters detailing which fungi species are obligately mycorrhizal and the kinds of tree each is associated with, in Fascinated by Fungi. Fairly frequent throughout Britain and Ireland as well as on mainland Europe and in Asia, Boletus edulis also occurs in the USA, where it is known as the King Bolete, although it is a matter of ongoing debate whether the American mushroom is in fact the same species as that found in Europe. Boletus edulis has been introduced to southern Africa as well as to Australia and New Zealand. The tubby-stemmed Cep shown above was found in heathland habitat in the Caledonian Forest near Aviemore, in central Scotland. There conifers are the dominant trees, but plenty of self-seeded birches grow beside forest tracks. 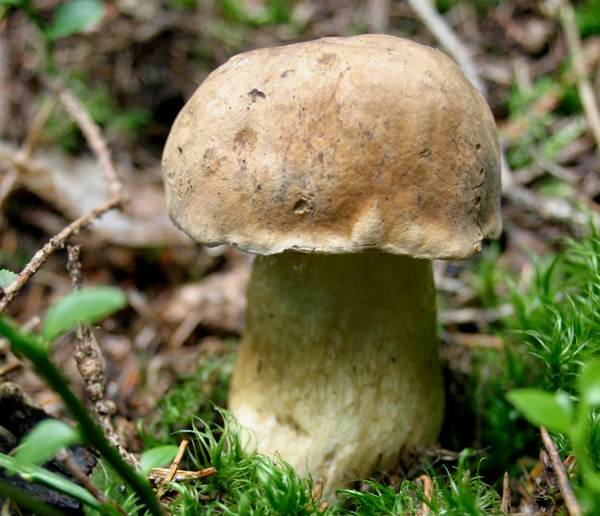 This bolete was first described in 1782 by French botanist Jean Baptiste Francois (often referred to as Pierre) Bulliard, and the specific name and genus remain unchanged today, so that Boletus edulis Bull. is still its formal scientific name under the current rules of the International Code of Botanical Nomenclature (ICBN). Boletus edulis is the type species of the genus Boletus. 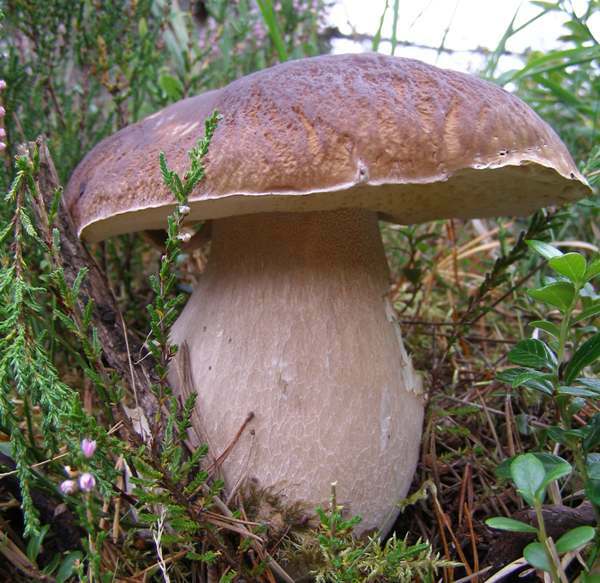 The generic name Boletus comes ​​from the Greek bolos, meaning 'lump of clay', while the specific epithet edulis means 'edible' - in this instance the mushroom is indeed good to eat, but beware: at least one specific epithet meaning edible has been attached to a poisonous fungus species: Gyromitra esculenta. 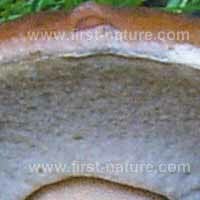 With a slightly greasy penny-bun-like surface texture, the yellow-brown to reddish-brown caps of Boletus edulis range from 10 to 30cm diameter at maturity. (An exceptionally large cap can weigh more than 1kg, with a stem of similar weight.) The margin is usually a lighter colour than the rest of the cap; and when cut, the cap flesh remains white, with no hint of bluing. 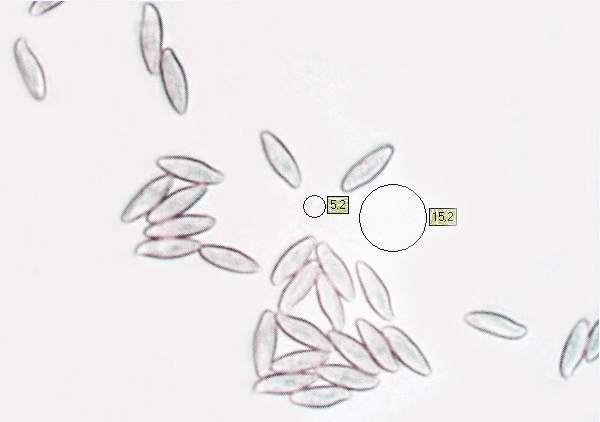 The tubes (seen when the cap is broken or sliced) are pale yellow or olive-brown and are easily removed from the cap; they end in very small white or yellowish pores. When cut or bruised, the pores and tubes of Boletus edulis do not change colour (as the pores of some otherwise quite similar species do). A faint white net pattern (reticulum) is generally visible on the cream background of the stem, most noticeably near the apex. Clavate (club-shaped) or barrel-shaped, the stem of a Cep is 10 to 20cm tall and up to 10cm in diameter at its widest point. The stem flesh is white and solid. 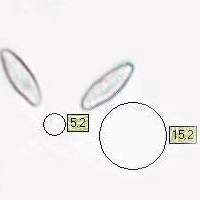 Subfusiform, smooth, 14-17 x 4.5-5.5μm. Boletus edulis has a faint but pleasant smell and a mild nutty taste. 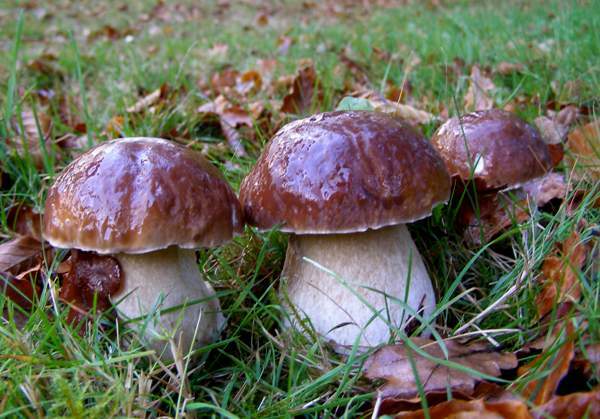 Boletus edulis grows on soil beneath trees, notably beech and birch, and less commonly oaks as well as pines, spruces and occasionally other conifers. In southern Europe this species is found in scrubland domonated by Cistus ladanifer and other rock rose species. 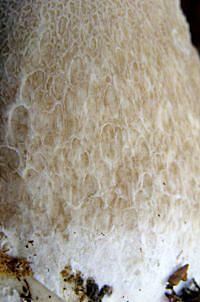 Tylopilus felleus has a darker stem and pinkish tinge to its pores; it has a very bitter taste. Boletus edulis is one of the finest edible mushrooms. Although it can be used in any recipe calling for cultivated (button) mushrooms, there are some dishes in which it truly excels. It is great in rissotto dishes and omelettes, and it certainly has enough flavour to make tasty sauces to be served with meat dishes. Do give our Penny Bun Starter a try; we think you will love it! When gathering these mushrooms for the table, those that are fully developed but still young are best of all. Caps can be very large (up to 30cm across), and so a family feast requires very few of these mushrooms - indeed, one large Cep is quite enough for a risotto for four people. One of the reasons that Boletus edulis is considered to be such a safe mushroom to collect for the table is that none of its close lookalikes is poisonous. 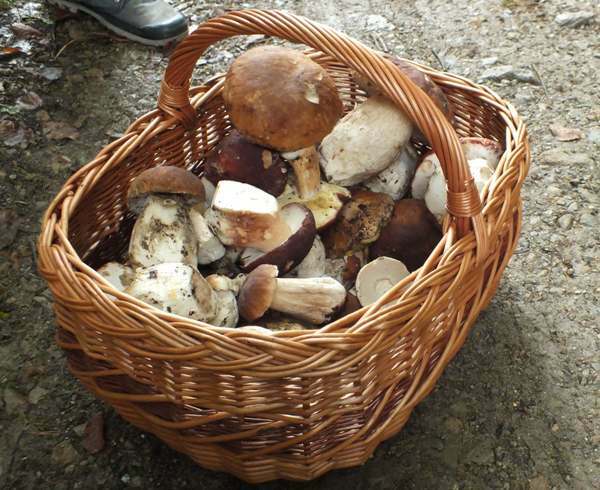 Provided you avoid boletes with red or pink pores you will at least be assured of a passable meal, and if you ensure that Boletus edulis dominates in the ingredients then your mushroom meal will be acclaimed as at least very good if not truly outstanding. 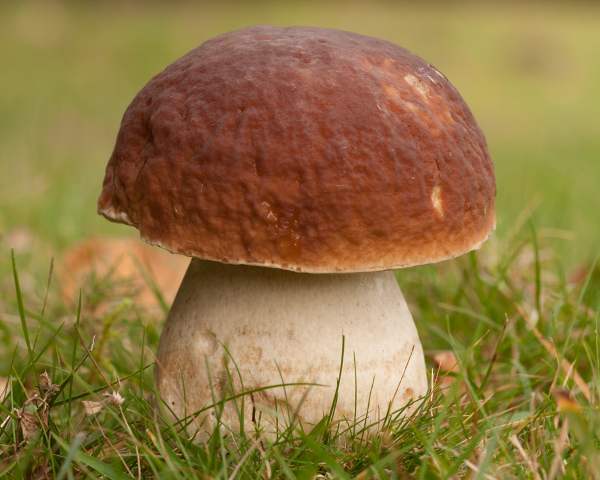 For example boletoid fungi such as Leccinum scabrum, the Brown Birch Bolete, can be used to bulk up a cep recipe with both safety and confidence that it will taste pretty good. 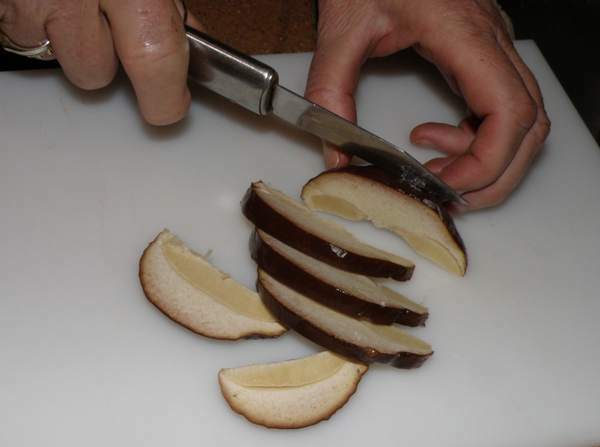 Boletus edulis tastes great when fresh; it is also one of the very finest fungi for drying or freezing. We dry our Ceps, as the flavour is certainly not degraded by the process and many people tell us that they find dried Ceps even more tasty than fresh ones. To dry these mushrooms, cut them into thin slices and either place them on a warm radiator or in a warm oven (with its door open to let the moist air escape). In the book Fascinated by Fungi (see the sidebar on this page for brief details and a link to full information, reviews etc) there is a good selection of magnificent mushroom menus all based on our 'Magnificent Seven', and Boletus edulis is, of course, one of the seven. After truffles, Ceps (although going by various common names depending on the country, culture and sometimes even the locality) are surely the most highly prized of edible fungi in Europe and the USA, where the name King Bolete is given to Boletus edulis.